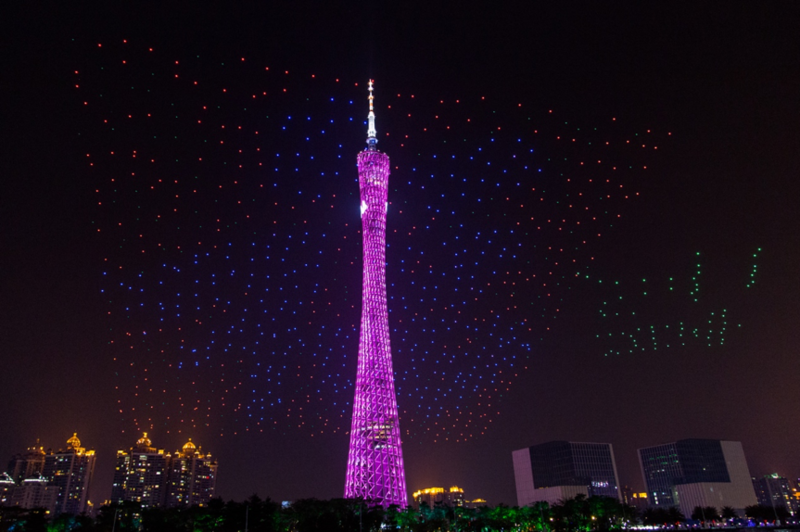 (February 11, 2017, Guangzhou) The world’s leading drone company EHang performed a 1000 UAV formation light show named “Meteor Sky” at the Guangzhou city center on the sky of the famous Canton Tower at the night of February 11, celebrating the Chinese traditional Lantern Festival through the art of innovative technology and refreshed the world record of UAV formation created by Intel’s 500 drone show in Germany in 2016. 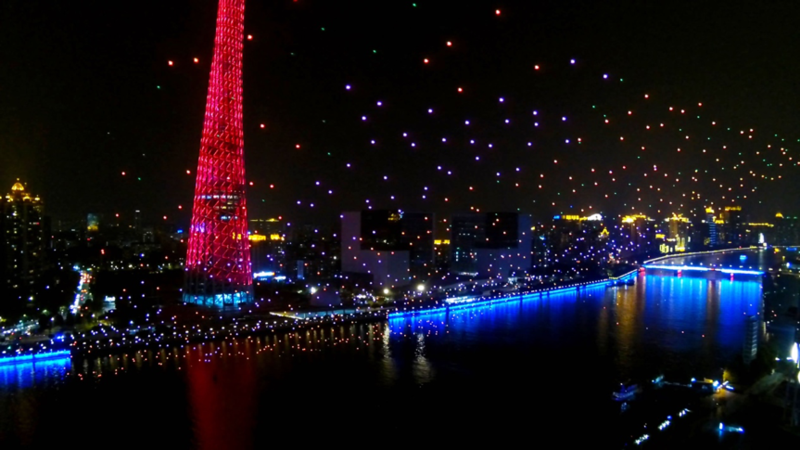 At 9pm of the Lantern Festival, a thousand EHang GHSOTDRONE 2.0 UAVs were neatly arranged on the 290 meters long and 19 meters wide “Walk of Fame” at the Guangzhou Haixinsha Square, shining festive color lights like a mighty dragon getting ready to fly. 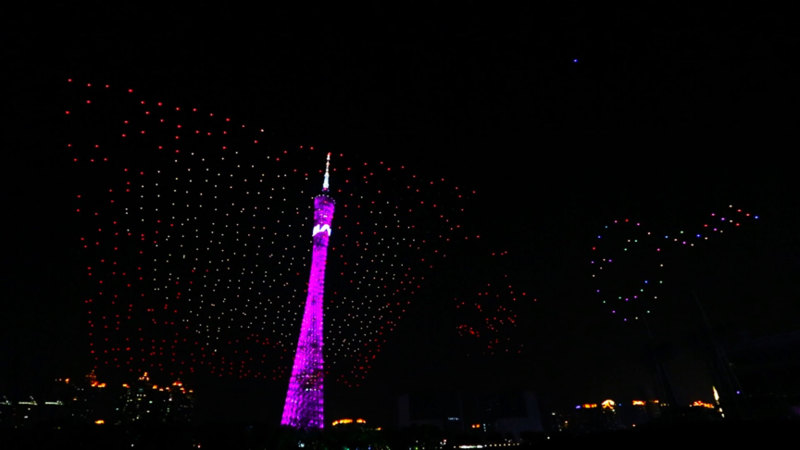 As the countdown clock alerts, a thousand UAVs took off gradually and ascended 100 meters towards the night sky in an orderly fashion like shooting stars. 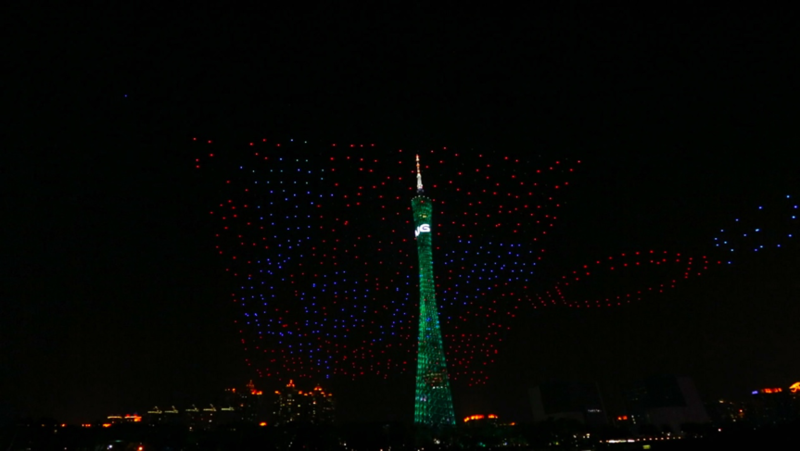 The massive night sky measuring 120 meters high and 280 meters wide became the best canvas for the 1000 UAVs to freely form their masterpieces. 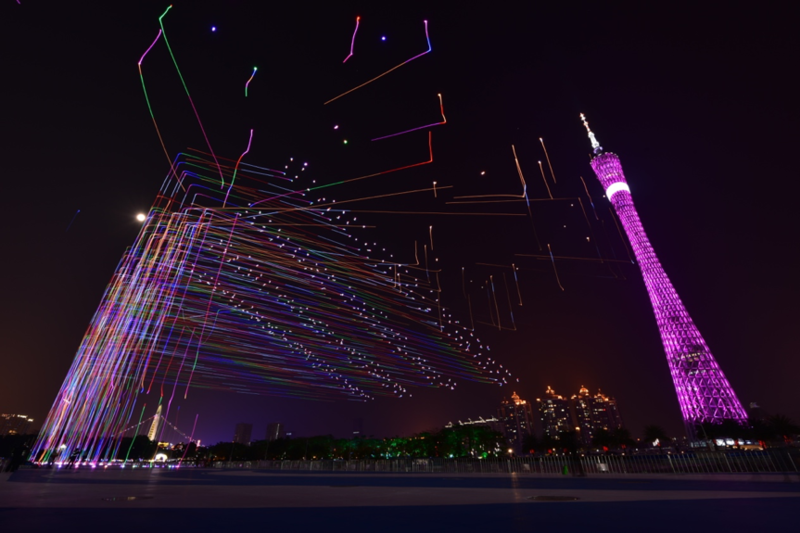 The audience were amazed and applauded to the constantly changing UAV formations ranging from neon rainbows, picturesque forms of Chinese idioms and blessings, calligraphies, and the map of China. 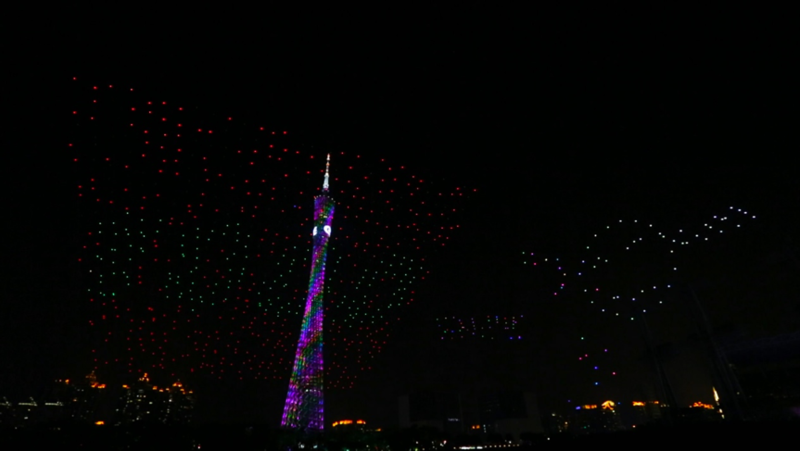 At last, this magnificent performance concluded perfectly with the formation- “1000” and EHang’s Logo, marking the new world record of the largest number of UAV outdoor formations. 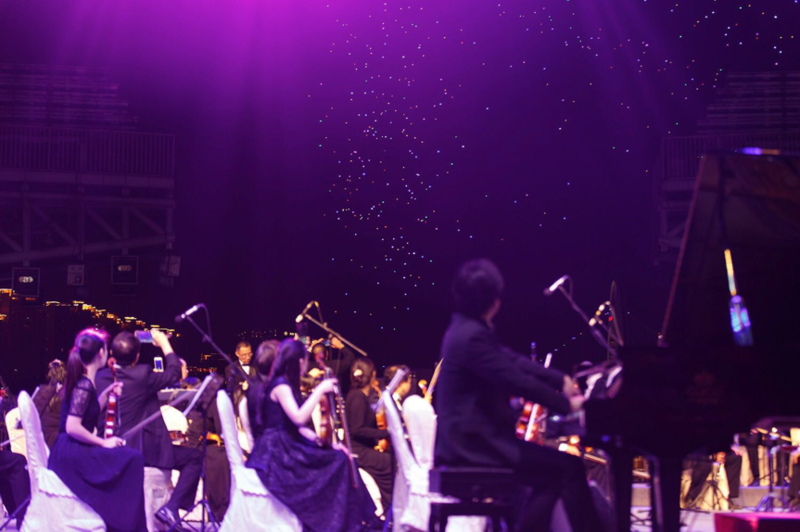 Throughout the sky show, musicians from the Guangzhou Symphony Orchestra were also performing wonderful musical pieces. 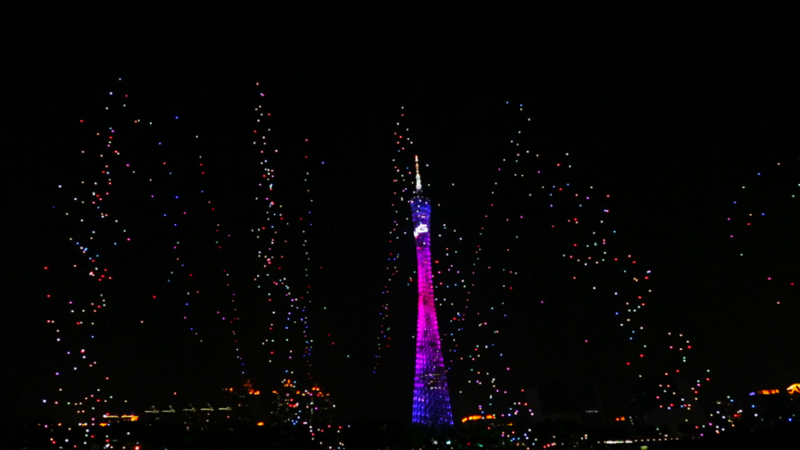 The sky formation show was accompanied by the swift melody from the renowned symphony originated from China “The Yellow River” , which the magnificent charm combined from the innovative technology and art amazed all the spectators. Organized by Guangzhou Tianhe District Government, Guangzhou City Construction Investment Group and EHang, this “Meteor Sky” 1000 drone light show was a successful trial to transform innovative technology as a new form of media and art with all Chinese elements to celebrate the Lantern Festive tradition instead of traditional fireworks to be more environmentally friendly and wonderful. 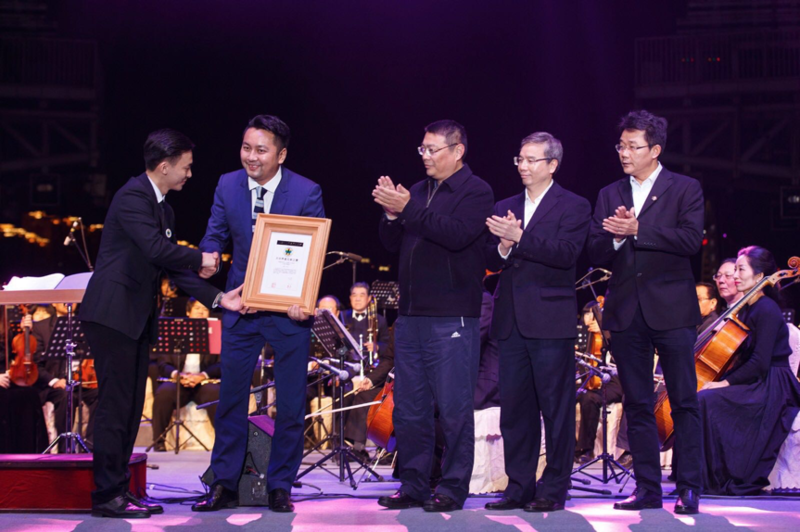 It is worth to mention that this performance of the 1000 UAV flight formation achieved a new world record, which cannot be obtained without the technology innovation and safety assurance from EHang team. 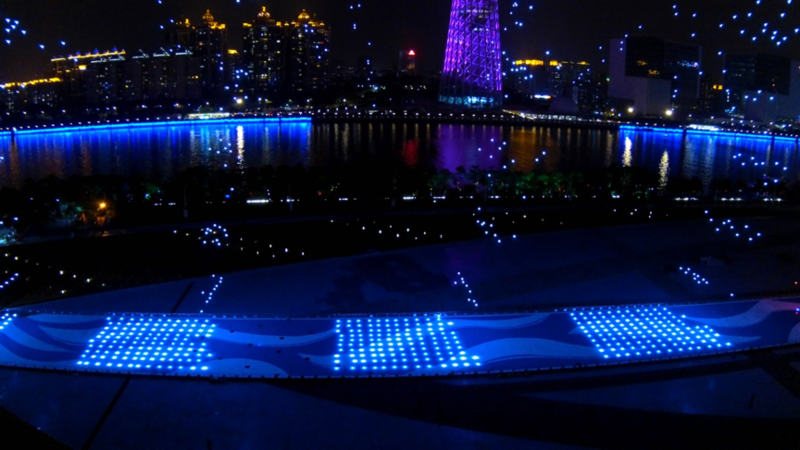 Based on the advantage of EHang GHOSTDRONE 2.0 hardware and intelligent software automation, EHang engineers designed a set of intelligent and efficient drone formation remote control system to use only one computer as a ground station to control and monitor thousands of drone flying missions, and to set the color changes of aircraft lights at the same time. It is a big challenge for the EHang team to perform the largest ever 1000 UAV formation which no one has ever done in the industry. In order to ensure the drones can complete various complex formation and multiple dynamic changes under environmental interference and limited space and time, EHang applied a high-accuracy positioning system to achieve a 1.5 meters distance between every drone in the sky to achieve a perfect performance with multiple UAV formations. Additionally, EHang engineers have put a lot of efforts on the safety issues. They not only double backed up each sensors of the drone to establish automated security system, but also used a real-time communication network to ensure the independent communication of every drone with the ground station. In order to avoid emergencies, several flight simulations were carried out before the flight task, and electronic protection zone and emergency auto return system were established to enhance safety. Of course, EHang strictly follows the Chinese national low-altitude flight regulation and always obtains flight permits in advance, to make sure the UAV formations are performed legally and safely. 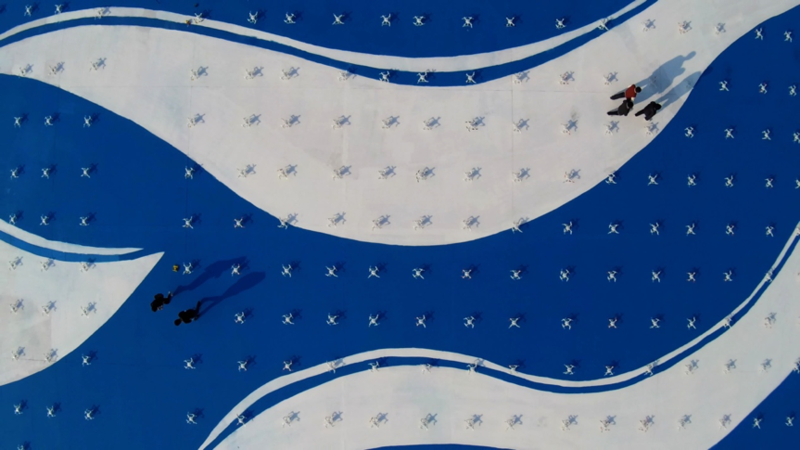 The six vivid UAV formations presented in the short 15 minutes required over 30 EHang technical engineers and staff members putting a few thousand hours and a couple thousands of UAV flights together for the rehearsal in advance. 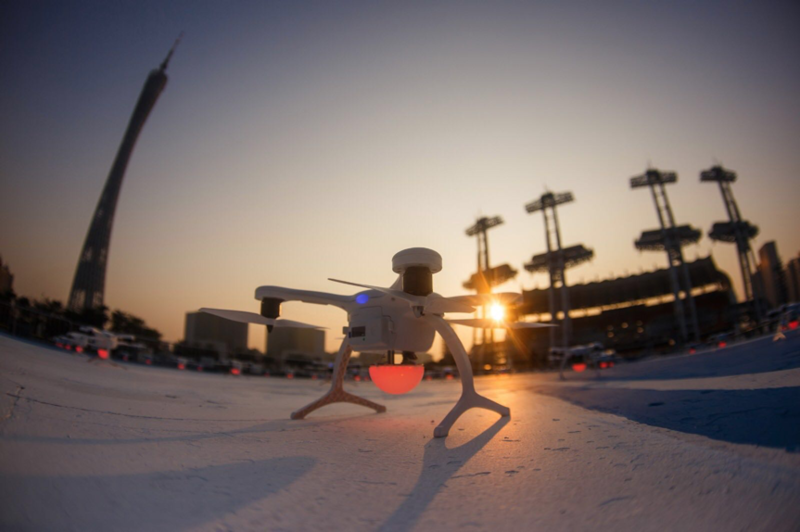 With the development of UAV technology and applications, audience are becoming fonder of UAV formation performances due to its safety, flexibility, beauty, and the concern for environmental protection. As a UAV technology company that insists on the combination of intelligent software and hardware in the industry, EHang founded the EHang Egret Media Technology Subsidiary in June 2016, to become the first in the industry to adopt a new technological media business model that relies on UAV hardware platform on the basis of the EHang UAV design and manufactural strength. With the aim to let UAVs create content as an expression of art and becoming a "Flyable New Media", EHang Egret is committed to develop a broader, more applicable, and more valuable UAV application market in the business, media, tourism and other fields in the future. 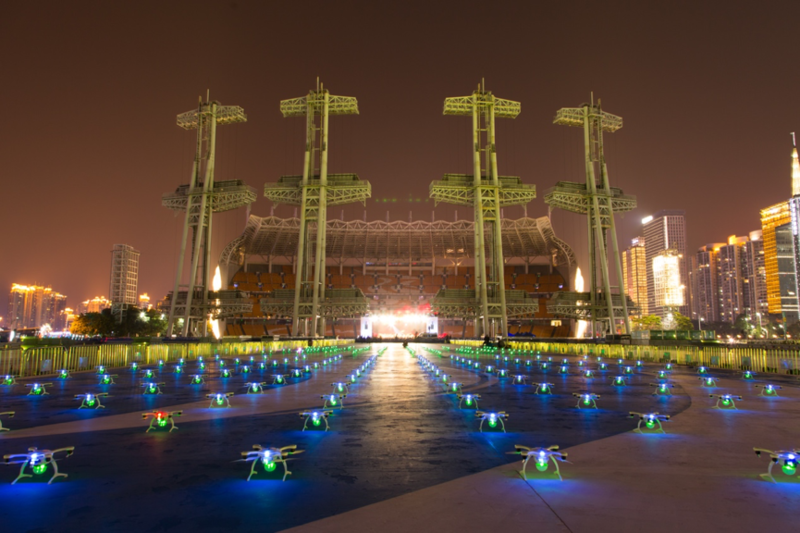 Before that, EHang Egret has done a lot of UAV performances with different scales in China, gradually from 30 drone light show in Beijing, 101 UAV performance in Chongqing, 128 drone performance in Guangzhou, to 150 drone show in Sanya, etc. In the future, EHang Egret will bring the audience more visual feasts by developing a more diverse forms and technology.